Haven’t thought of that song in years. Thanks for the reminder. Good post. What a lovely hymn, Warren! I haven’t heard that one before. I’ll have to look it up. Thank you so much for commenting! Be blessed! What a lovely thought, Lynn. I have a chapter in the works about being precious to God. Thanks for the inspiration. Once again, you’ve got me thinking. Beautiful post Lynn. We are precious to our Lord Jesus – a pearl of great price! We are indeed a gem in our Lord’s Treasure Chest, and we shine and sparkle as we reflect His light to others… What a great thought that we ride upon His Shoulders as our High Priest, and forever in His Heart. Love this post, Lynn! 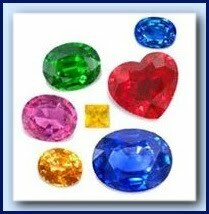 Beautiful thought that we, as believers, are gemstones on the heart and shoulders of Jesus! Thanks for sharing this wonderful picture! Have a great week, basking in the blessings of the Lord! A gemstone… that sounds precious to me Lynn, thanks! Thank you for stopping by. The signup is located at the end of each post and in the sidebar. Appreciate it. Blessings to you!